I guess some jurisdictional questions are easier than others. 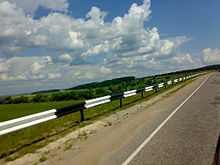 Prosecutors often look at whether an interstate road was used in a crime, but what is the crime is the interstate road? It may sound like a Yakov Smirnoff skit (“In Russia, you don’t steal away on the road, the road . . . “) but in Syktyvkar, Russia a man was arrested for stealing 82 reinforced concrete slabs that made up a road outside of a city. This guy actually used heavy machinery to lift the slabs and load them on three trucks. They are worth just $6,100 but it appeared to be better than the alternative. By the way, stealing a road will only get you a maximum sentence of two years in Russia. He is likely to spend less time than what you get for protesting Putin’s policies in a church. Well he will have good company I’m sure… The Riot Pushys…..
Close enough for a cigar. Actually, I think he was arrested for getting caught. This actually sounds reasonable compared to the news today. We be hatin’ on Russia today!